The Grand Mosque of Paris was opened in 1926 on land donated by the French government in tribute to the many Muslims of her North African colonies who fought and died for France in World War I. At the time, most of the mosque’s members were Kabyle Muslims, Berbers from Kabylia in Algeria. It is a large place with both religious and social areas, including living accommodations, so that many people can be within it’s walls at any given time. When the Nazis invaded Paris in 1940 and began their roundups of Jews for deportation, it did not take long for the rector of the mosque, Si Kaddour Bengharrit, to realize that the Muslim community could do something to help the Jews – they had both the space and the means to do this. And so the Muslims of the Grand Mosque began to rescue Jews, and within three months of the Nazi occupation of Paris, the rector and his congregation were suspected of and warned against helping anyone escape to safety. Yet, there is enough evidence to prove that it happened and Ruell and DeDaix present the story in part by using examples of people who had been helped. One such person was Salim Halali, a Berber Jew from Algeria, studying in Paris to become a singer. Salim found refuge in the mosque and received a “Certificate of Conversion” from the rector. The rector even had a stonecutter called in to carve a false gravestone with Salim’s family name on it for authenticity. Although Salim remained at the mosque until the war was over, most of the people who received help did not stay as long. In fact, only those Jews who also looked North African were able to stay in the mosque for more than a few days, since it was easy for them to pass as Muslims. Those who did not look North African had to be guided out to safety as quickly as possible. According to Ruell and DeDaix, the Muslims had a real advantage as far as the Nazis were concerned. Though the mosque was suspected of helping Jews, the Nazis didn’t target its members for it because they feared an uprising of Muslims in Northern Africa and the Germans were already fighting the Allies there. And on the occasions when the Nazis did show up to search the mosque, the members had various ways of delaying their entrance, giving the people inside time to hide. 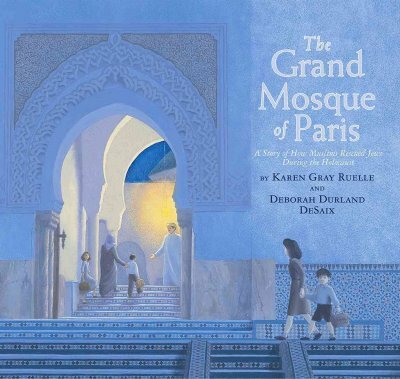 In addition, though the authors do not indicate whether or not they were actually sick or orphans, many of the Jewish children brought to the mosque were sent to Muslim clinics outside Paris to protect them from the Nazis. These clinics were run by a Tunisian Dr. named Ahmed Somia. There, they administered to the children as well as Allied pilots, parachutists and even spies who found themselves injured and trapped in France. The Muslim helpers had many ways of doing what they needed to do in order to help the Jews. Ruell and DeDaix explain that as members of the French Resistance, the Kabyles could safely carry messages and instructions written in their native language which was difficult and understood only by other Kabyles. As businessmen, they were also able to sneak people into the mosque with the help of their deliverymen using a three-wheeled bicycle with a large bin in front. Once inside the mosque, the members could provide the escapees with whatever they needed until they could be secreted out through a complicated series of tunnels. These tunnels, sometimes compared to the American Underground Railroad, were the result of stones quarried underground for constructing the buildings in Paris centuries ago. The Jews would then be led through the tunnels to the River Seine and put on to barges. There, the Jews were hidden in the large barrels that were used for delivering wine to Paris. The authors also did the illustrations for this book and they are simply lovely, providing a real sense of the story. The Grand Mosque is, in reality, a truly beautiful place and the illustrations capture much of the artistry of the North African craftsmen who built the mosque. The illustrations give the sense of an oasis of peace and calm and safety in a world gone mad. *A hadith is a saying attributed in some way to the Prophet Muhammad. This is a great, insightful post about a book that seems important today given the political climate in the U.S. I love stories about people reaching across cultures and helping one another in times of need. Also, I can't believe I've been to Paris three times now and didn't know about this mosque! Guess I'll have to make a fourth trip.